The double-salmon motif that Rhonda Reaney created for the Sitka Conservation Society combines the sleek elegance of the sea-run sockeye with the focused intent of the spawning female sockeye. The double salmon reflects the interconnectedness of the Ocean environment and the lands and waters of the Tongass Rainforests. Rhonda describes the top salmon as being full of life. 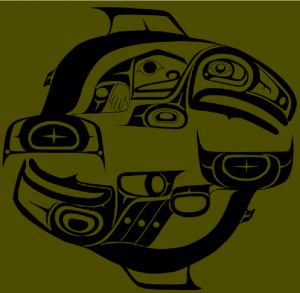 The body incorporates human symbols with an eye representing the nutrients the salmon collects in the ocean.. The bottom Salmon is ready to spawn. Rhonda did not add any life to this fish other than the round-eggs it is going to lay to start a new cycle of life. The shape of the back represents the motion of the fish in the act of spawning. Available in t-shirts and hoodies in the SCS store. 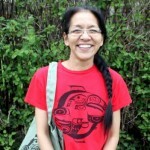 Rhonda Reany was the youngest of eleven children. She grew up surrounded by talented brothers who loved to carve. As they became allergic to carving wood, she would be handed the designs and she slowly learned. Since she was young, she often watched George Benson carve. Learning from his work, talking with elders, other artists and through books at the local library, Rhonda quickly developed into a very talented artist. Her art is inspired by values distilled in her by her mother and father. Her mother always taught her that you take what you need and to always give back. Rhonda incorporates her mother into every piece of art that she completes by adding a simple, elegant cross. The Sitka Conservation Society works to protect the Wild Salmon of the Tongass National Forest. With over 6,000 spawning streams home to Pink, Chum, Sockeye, Coho and Chinook Salmon, Salmon are a keystone species on the Tongass and a crucial link between the forest and the sky. These Salmon are an essential part of Sitka’s economy, culture and food supply. The Tongass National Forest produces 30% of Wild Salmon in Alaska from just 5% of the land. Statistics prove that the most economically valuable resource that the Tongass National Forest produces is Salmon. SCS has protected Tongass Salmon through our historic efforts to achieve Wilderness Designation for the West Chichagof Wilderness Area— 260,000 acres of salmon-producing watersheds. SCS continues to advocate for land management on the Tongass that focuses on restoring and protecting critical salmon habitat and intact watersheds and has helped to catalyze important Salmon habitat restoration projects on Baranof and Chichagof Islands.